Synopsis There was an old man who went to Hong Kong History Museum to see the tram. He sits on the driver's seat, trying to have a taste of driving tram again, after his retirement from a tram driver years ago. Suddenly, the museum's wall cracked, and the tram started moving. As the tram travelled, the old man became younger, and more and more passengers appeared. He cherishes his tram very much. After he has completed his work every day, the man cleans up the body of the tram. He also sticks a unique logo on to the tram. One day, when he was driving a tram, the buildings next to the tram gradually disappears. After then the tram has travelled for some distance, a lot of buss overtake the tram from behind. New buildings also appear to replace the older. Finally, the last tram which is driven by the man disappeared, and the man wakes up from his memory. Cheung Ka-yung, fifteen years old, has learned 3D computer animation for about 4 years and has joined the 3D COMPUTER ANIMATION CLUB since 2009. Now, he is a form 5 student in Shun Tak Fraternal Association Yung Yau College. He first finished his first animation in 2010 called "Danger". Then, he made his second animation with LAM Ching Chiu in 2010, called "Future" which is about environmental protection. This is the first champion that he had got in the Hong Kong Youth 3D Animation Competition 2010. In 2011, he made the animation called "Lonely" with LAM Ching Chiu again. 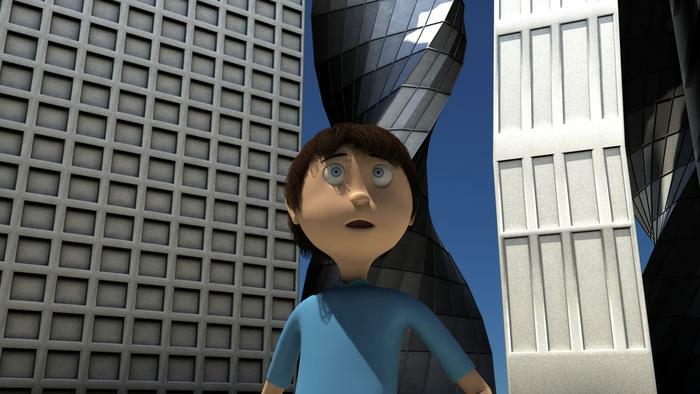 That animation won the 2011 International Student Media Festival Best of festival Award, which was the highest honor of the festival. Lee Chak-hin ,a boy and 16 years old. He comes from Hong Kong. He is a Form Five student. He acceded a 3D computer animation course at school. It was because he was interested for the 3D character and 3D special effect or trick. During he makes the 3D animation, he should use computer software called Maya. The 3D software is really difficult to use and control. He usually have many problems about it. It is a big challenge for him. He just learnt this 3D animation computer software for 5 years. After that, he joined a 3D animation competition. It is a good experience for him. Nowadays, 3D animation technology is really common. It can train his creative thinking. He can learn much knowledge about 3D animation. — Shared by Cheung Ka-yung, director of Memory, after attending the 8th International Youth Media Summit 2013 in Serbia, under the sponsorship of NAE. — Shared by Lee Chak-hin, director of Memory, after attending the 15th Seoul International Youth Film Festival, under the sponsorship of NAE.